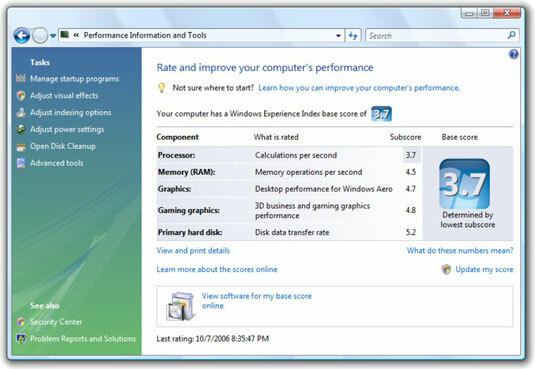 Windows Vista uses a sophisticated, multitalented program called WinSAT, or the Windows System Assessment Tool, to determine its benchmark settings, which it calls the Windows Experience Index (WEI). It’s a good idea to view your computer’s WEI score when you’re considering installing new hardware or software to ensure that your computer can handle the upgrades. WinSAT runs when Vista is first installed and when certain hardware, such as a new graphics card, is installed. In the beginning, the WEI score was used to determine whether Vista would first appear with the Aero Glass see-through interface running; less-capable video cards don’t get Glass. Application installers use your WinSAT scores to modify a program’s options to take advantage of your computer’s capabilities (or lack thereof). So the numbers you see in your Windows Experience Index (WEI) may influence the features of the software installed on your computer. Choose Start→Control Panel. Click the System and Maintenance link. Under the System icon, click the Check Your Computer’s Windows Experience Index Base Score link. You’ll see the WEI score for the computer’s processor, memory, graphics, gaming graphics, and primary hard drive. Windows recommends that you use these hardware scores when you’re out to buy hardware — say, a new hard drive, or a video card, or even an entire new computer — the benchmark should help you compare among the products on offer. If you’ve changed hardware recently — or if you’re looking at a computer in a dealer’s showroom or at a friendly fleamarket — you should consider asking Vista to update the score (by clicking the Update My Score link). Because Vista doesn’t recalculate the Windows Experience Index score very often, it may be possible to jimmy the score. Best to run an update and be sure that the score you see matches the hardware in the box. Microsoft claims that the Windows Experience Index can help you choose software. If you’re looking at a program that requires, say, a WEI rating of 4, and your hardware only comes in at 3.5, presumably the WEI can keep you from buying a product that runs like a slug. An alpha blending test that determines how quickly your graphics card can blend together two colors in a standard, semitransparent way. A straightforward calculation test that assesses the graphic card’s computing power when working with shades. A shader texture test that measures the graphic card’s ability to load textures. When WinSAT runs its graphics tests, the three raw scores go into a blender, and the result is a WEI score between 1.0 and 5.9. This score tells you what the computer can handle.